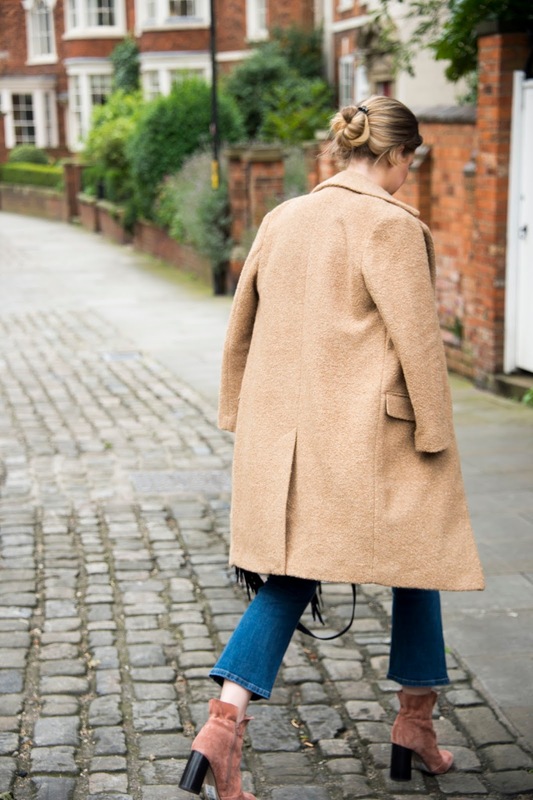 The coat in question, (Next's very own take on the ever-in-vogue camel boucle) has satisfied a long quest on my part to find a camel coat that I can wear with pretty much anything. I really wanted a coat that had a certain fluidity to it; that could be styled casually or more formally and would really work in either situation. For me, this coat does exactly that! It also has the sweetest ‘teddy bear’ texture (as my husband refers to it) which gives it just a little more detail than a regular coat. It definitely draws the eye, put it that way! I've also amped up my collection of knitwear for this season, which just so happens to be a category that Next also manage to nail year after year. They honestly have some of the loveliest jumpers in stock at the moment and I can't help but do double- take every. single. time. I am trying to manoeuvre my way past the women's section towards the kids section. Seriously, talk about distraction on every level- albeit, a very happy distraction! 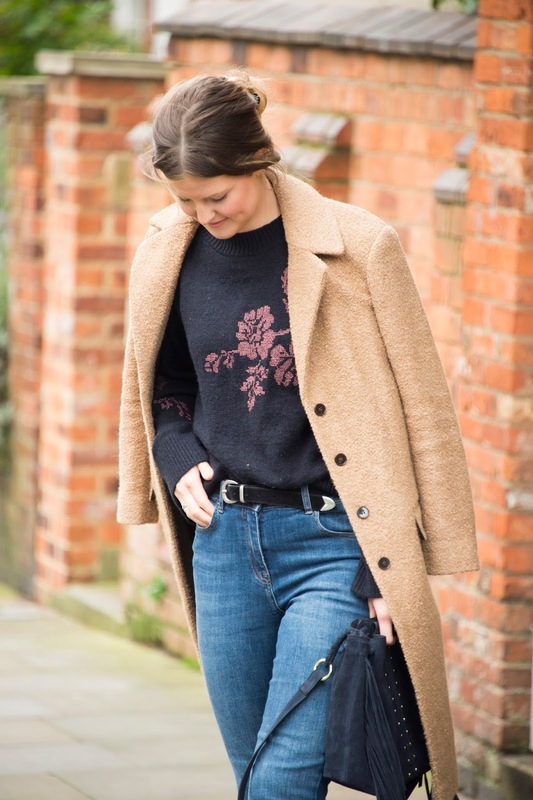 For this look, I went for one of their new season embroidered jumpers with subtle bell sleeves and rose gold detailing. 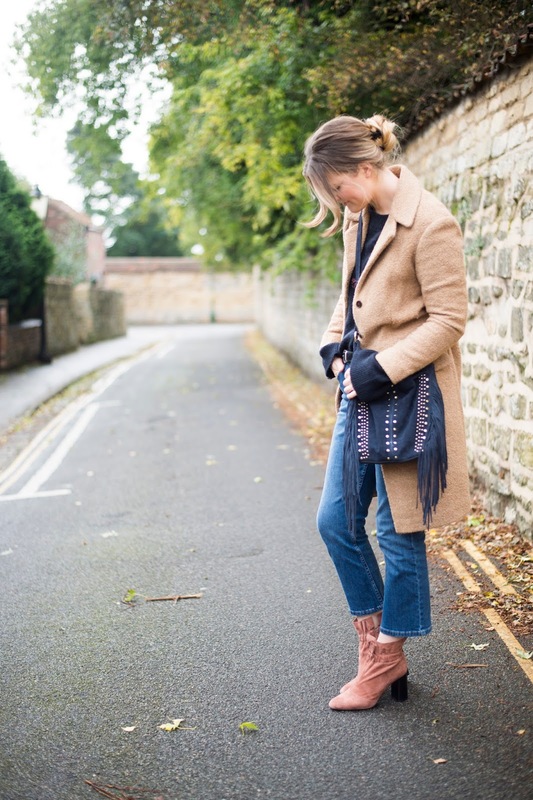 It's a match made in heaven for these boots as well as the bag and it is SO cosy too. I think I am going to be living in this for those wintery morning school runs! The bag I chose for this particular look is a gorgeous navy suede leather with a bit of a tassel party going on at the front! Being completely honest, this is definitely one of my more edgier choices of handbag as I tend to play it reallllly safe with accessories. However, I just LOVE swinging this around with me. I also think it brings a touch of fun to my typical mum attire which is definitely no bad thing! After all, it's good to think outside of the box every so often, am I right? 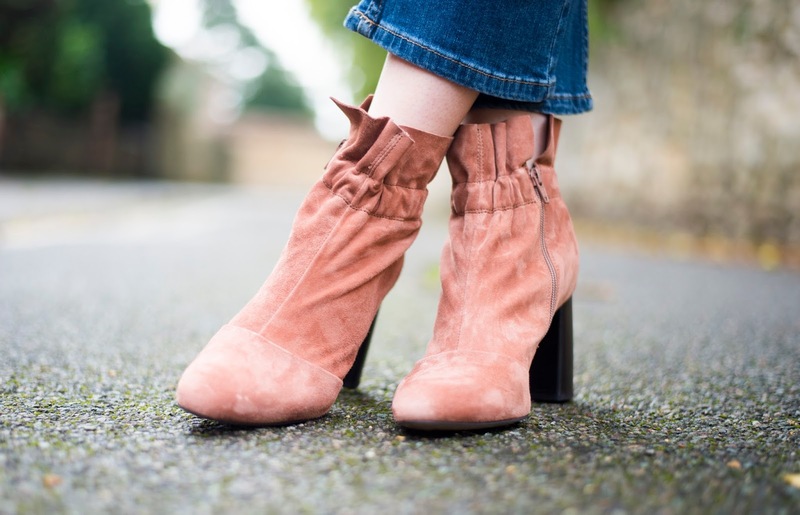 If I had to pick just one item, I think my absolute favourite part of this look would have to be these blush suede leather boots. Honestly guys, if I were a boot, I would look like these! (Is that too cliche?) Ha! They are seriously beautiful though AND so comfortable to potter about town in. I love that they work with any jean cut- hence pairing them with these gorgeous cropped bootcut ones from the new season collection! But honestly, I don’t know what it is; the ruffling, the gentle pink hue, or the fact that whilst they are high they are so easy to move about in…they just have it all in my book and I can’t wait to keep restyling them throughout the season. You can definitely expect to see these beauties plastered over the blog in the meantime! I really feel that over the years Next's womenswear, in particular, has become more translatable to everyday life than ever before. I think that’s one of the things I love most about the brand in general; it simply knows how to dress women to look and feel their best, regardless of shape, age or other factors. For me, Next streamline fashion and make it accessible to anyone and that is why I keep coming back to them, time after time! If you had to summarise your favourite ‘go to’ autumn look, what would it be? *This post was written in collaboration with Next who kindly gifted me the clothing. Staying productive as a mummy | Top tips! Mummy of three...how do you do it?